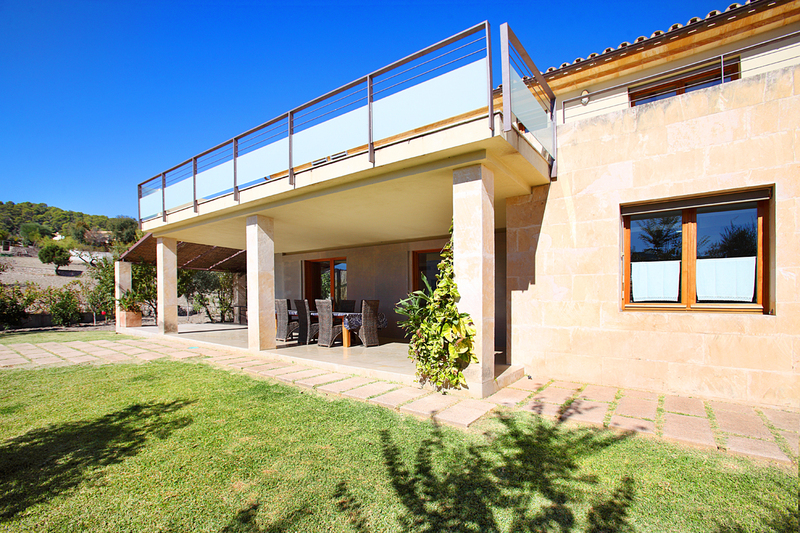 Magnificently reformed farmhouse of the highest standard, a natural blend of the "old and new" with an excellent standard of furnishings and fittings. 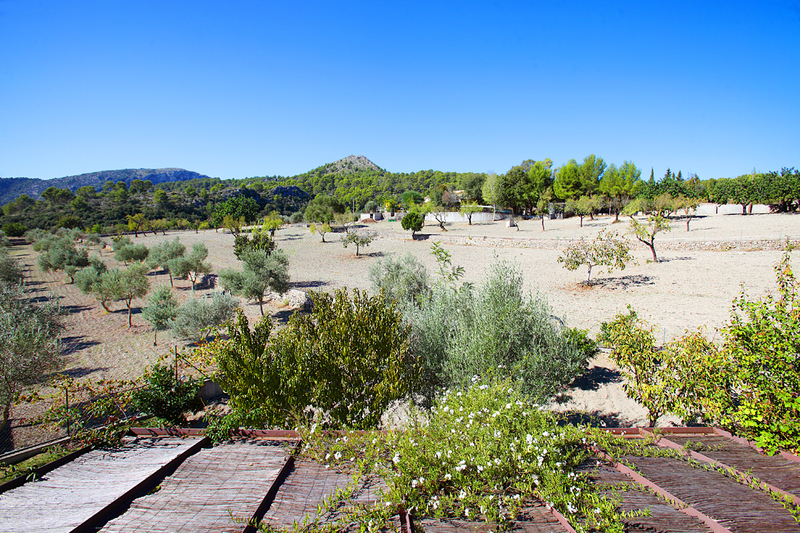 One of the finest properties available in the Pollenca area and a delightful family home. 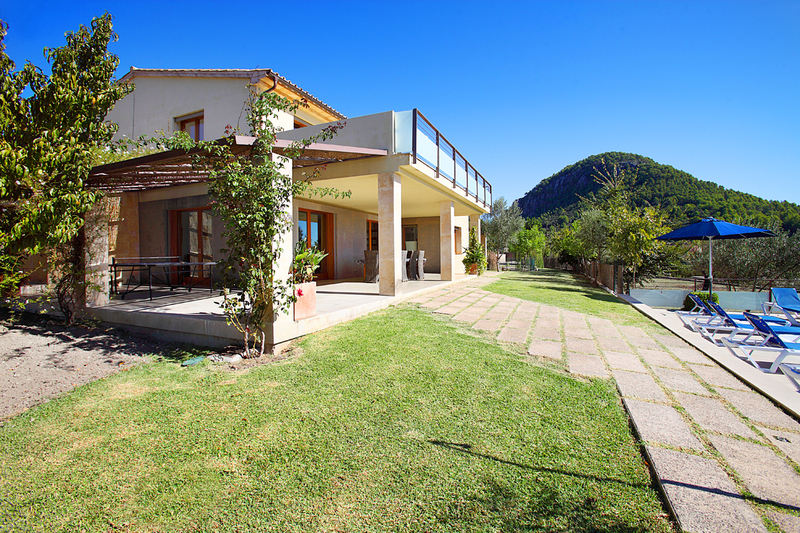 Within walking distance (500m) to Pollenca. 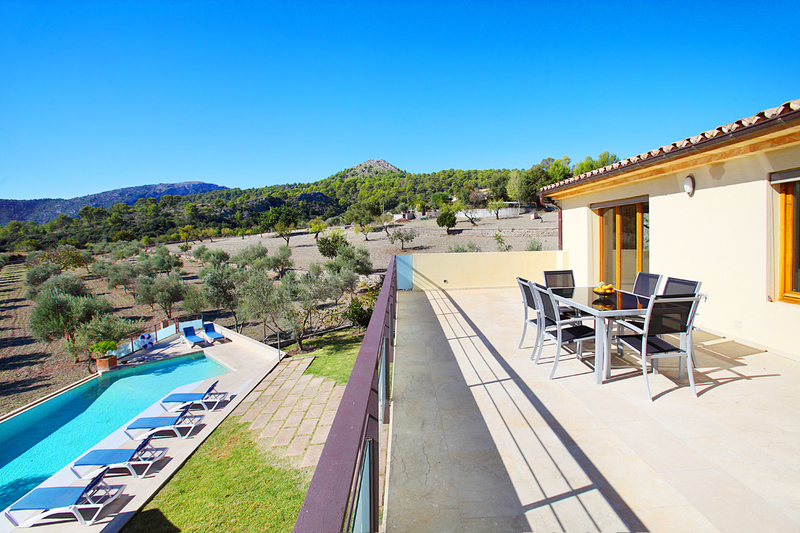 Set in an excellent location just outside Pollenca and enjoying a countryside ambience with truly stunning views to pine clad mountains, La Rafal De Rosser Vell is an impressive brand new property. The beautiful sandy coves of Cala San Vicente and the long stretch of beaches at Puerto Pollenca are all within a few minutes drive. 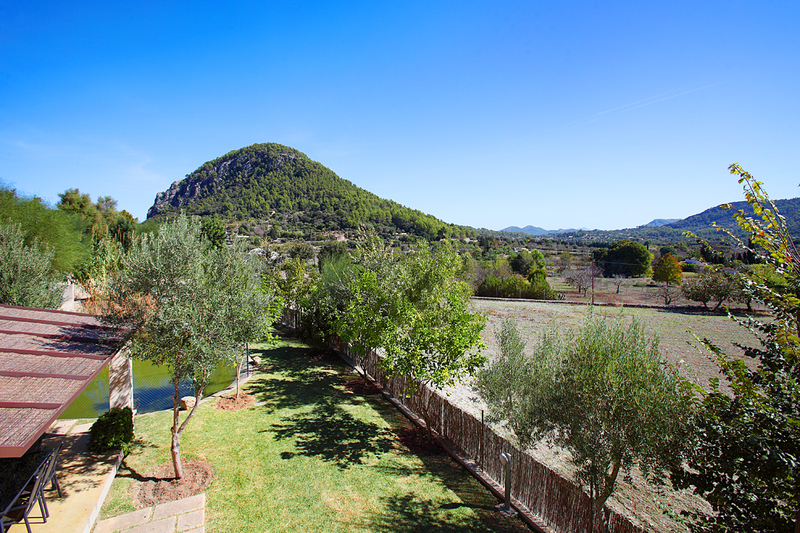 Pollenca is only 600m walk along a country lane. 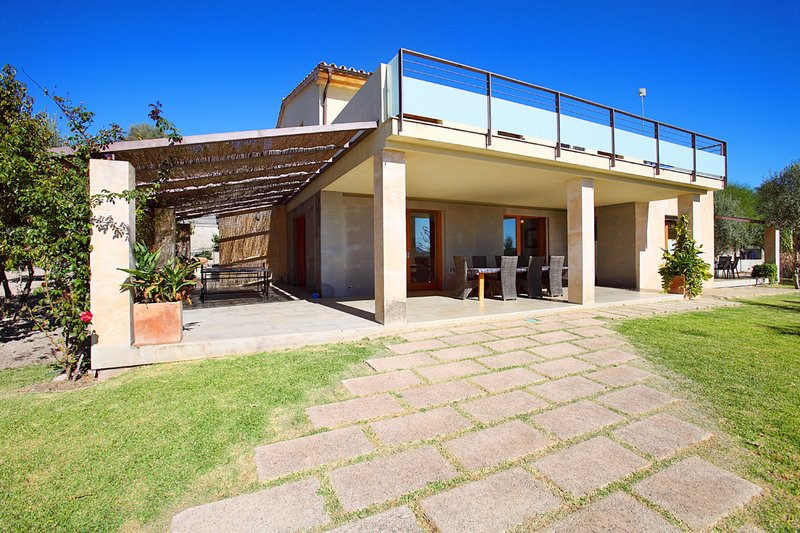 From the minute you open the front doors you will enjoy the opulence and originality this property has to offer. 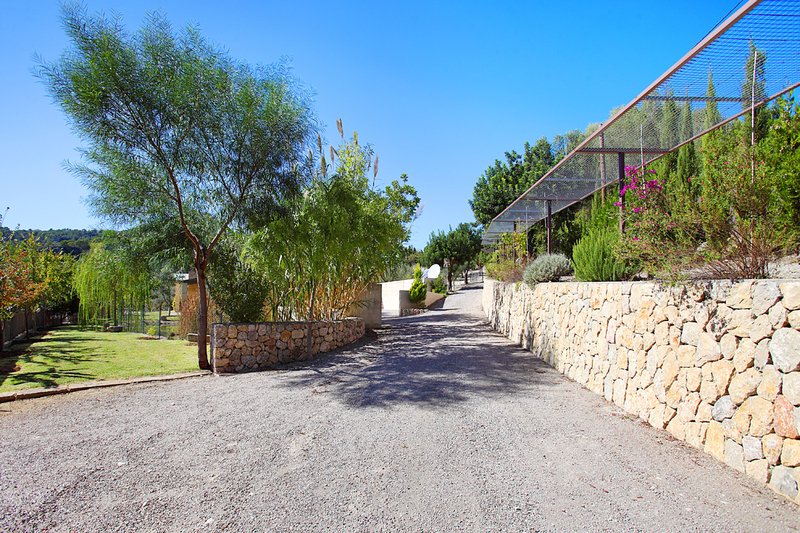 Stone arched entrance and double wooden doors lead into the spacious hallway. 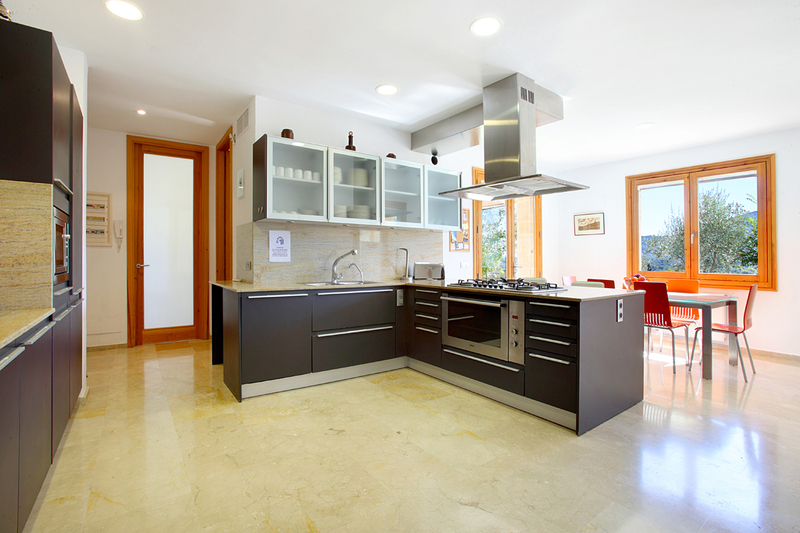 Straight ahead a door and one step down leads into a vast kitchen which is a culinary artist's delight as it boasts a chef's station, sophisticated electric oven and six ring gas hob. 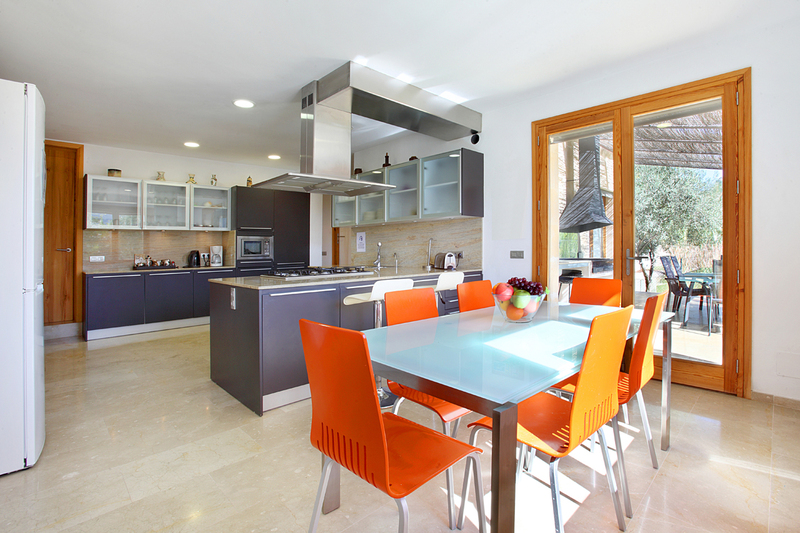 The kitchen is very light and airy, granite marble effect worktops and stylish cupboards along with glass table and chairs giving an "ultra modern" look. There are two full sized fridge/freezers, dishwasher and microwave. 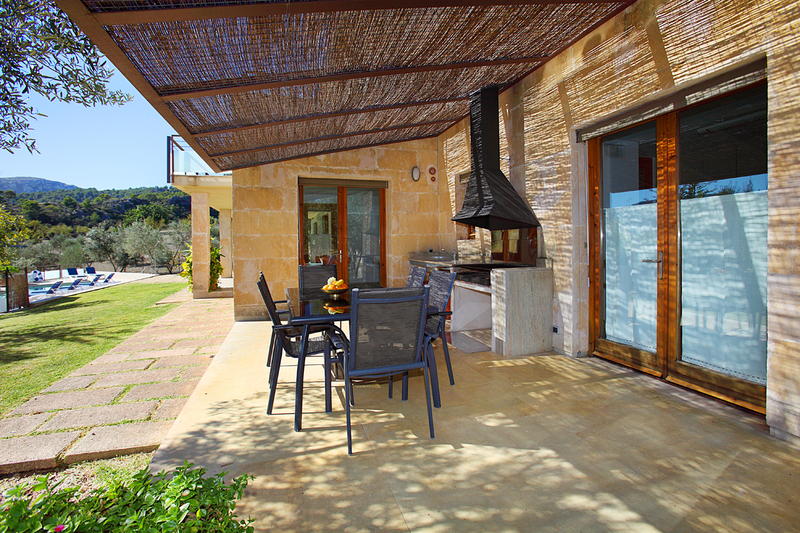 To the rear of the kitchen a door either side gives a choice of stepping out on the side BBQ terrace or the rear covered terrace with large wooden dining table and raffia chairs. 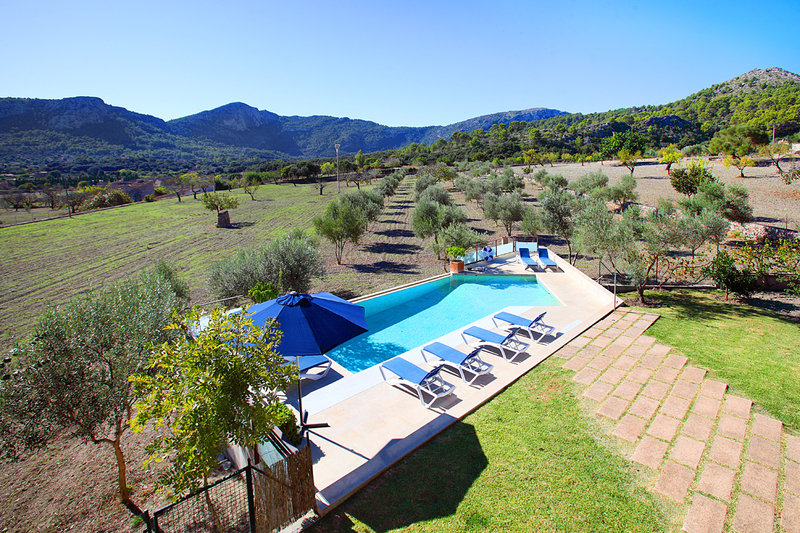 There are stunning views of the Puig de Maria and across the surrounding countryside. 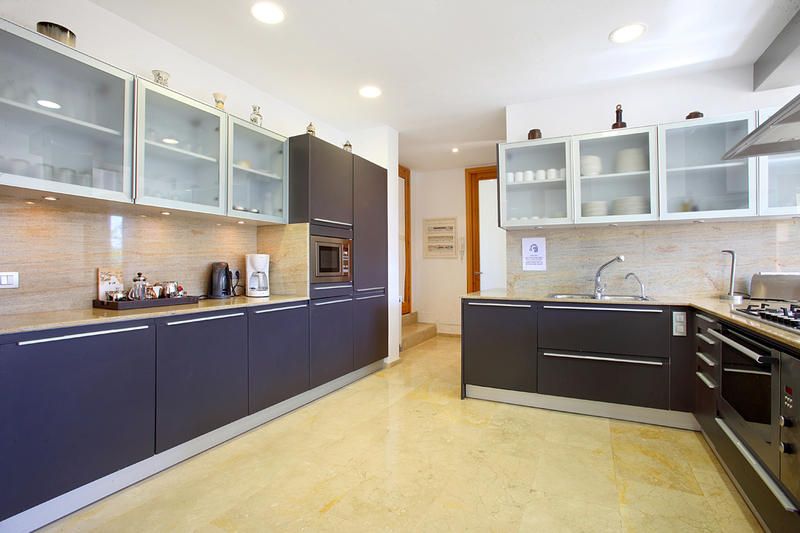 Just off the kitchen area we find a spacious "walk in" pantry and a utility area with washing machine. 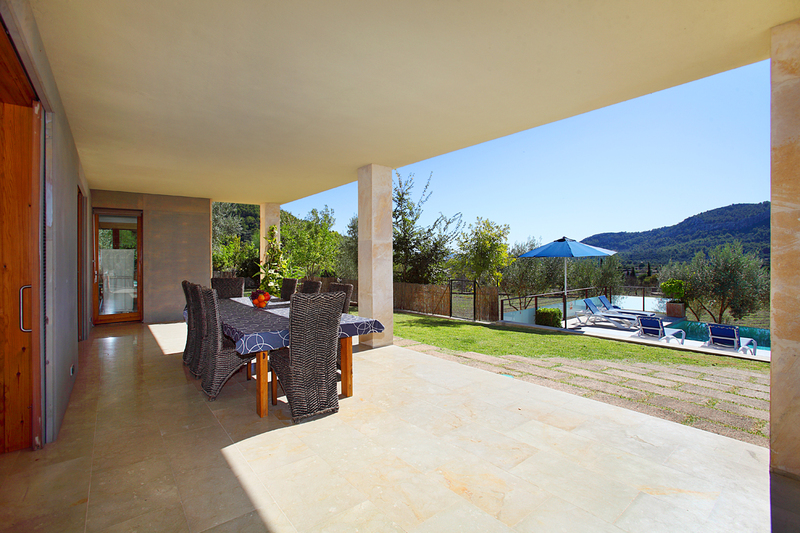 Two large glass doors open on to the rear BBQ terrace. 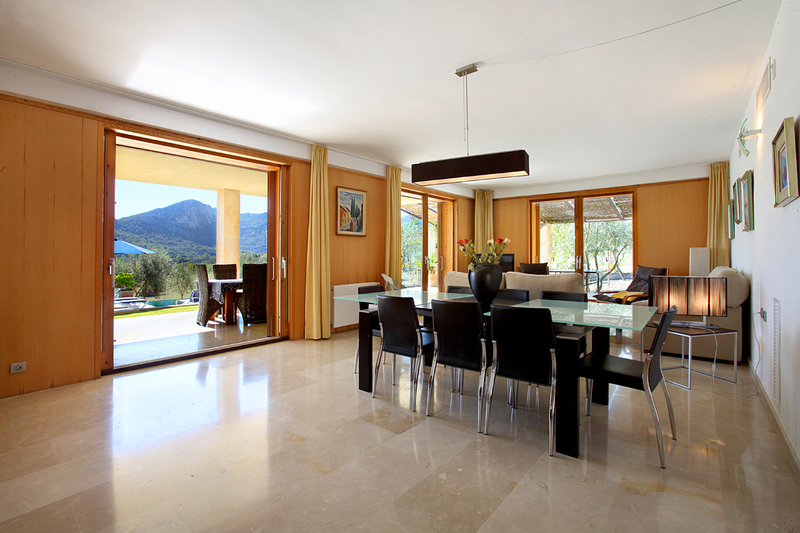 To the right of the kitchen are the floor to ceiling glass doors which open into the comfortable lounge/dining area. 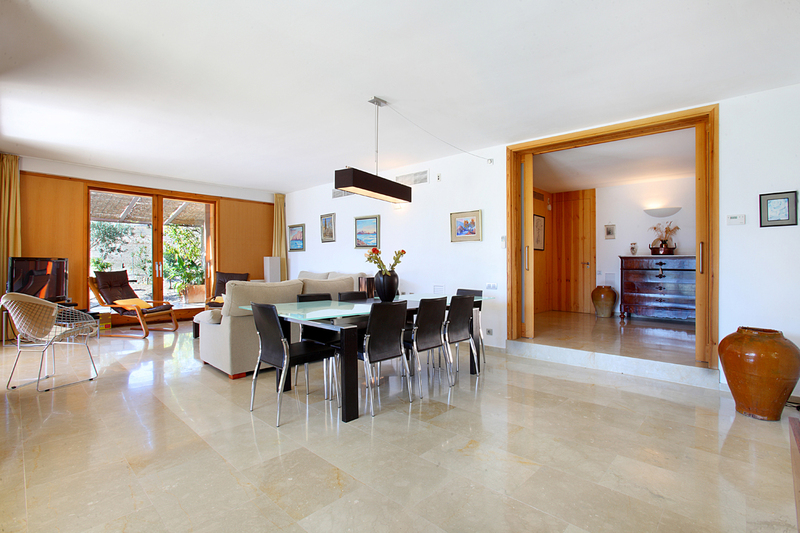 This theme continues as triple sets of glass sliding doors open out onto two different terraces. A further set of sliding glass doors open back into the entrance hall. 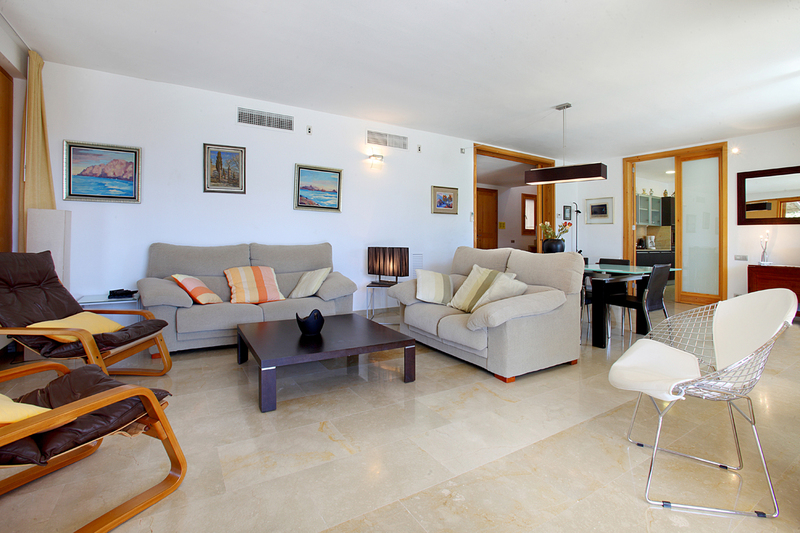 There is complimentary Satellite TV, DVD player and PlayStation 2. 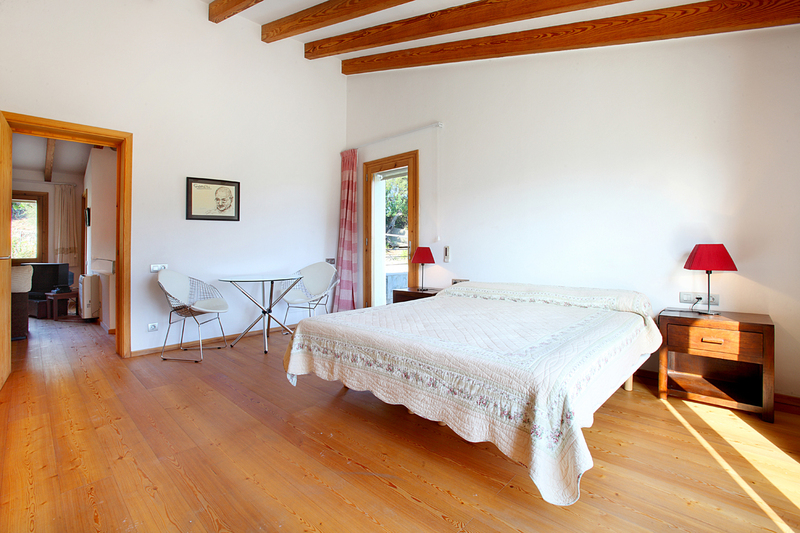 To the right of the entrance hallway we find a twin bedroom with en-suite bathroom. 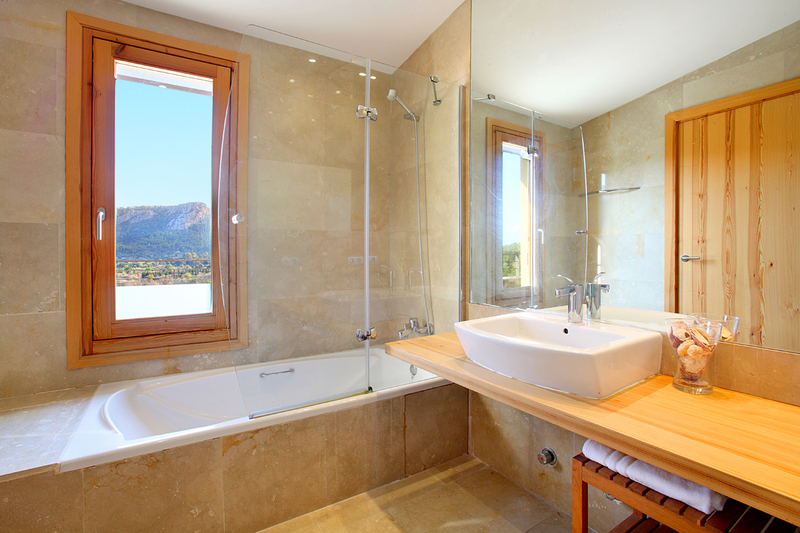 The bedroom has marble flooring and the bathroom is pretty with beige tiling and an enormous mirror. Downstairs there is also a shower room with walk in shower WC and hand basin. To the left of the front door the impressive staircase leads up to the rest of the sleeping accommodation. 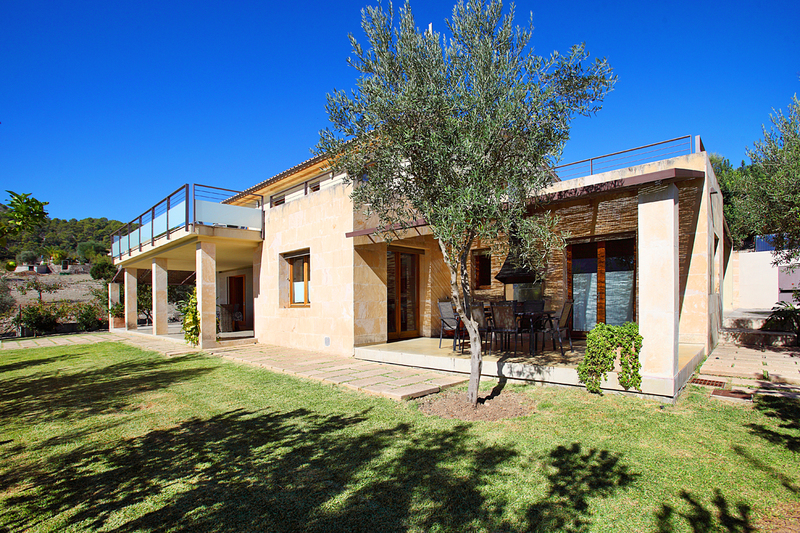 All the bedrooms have vast built in wardrobes, high wooden beamed ceilings making them light and airy, parquet flooring and en-suite bathrooms with pretty beige floor tiles. At the top of the stairs is a comfy seating area with Satellite TV. 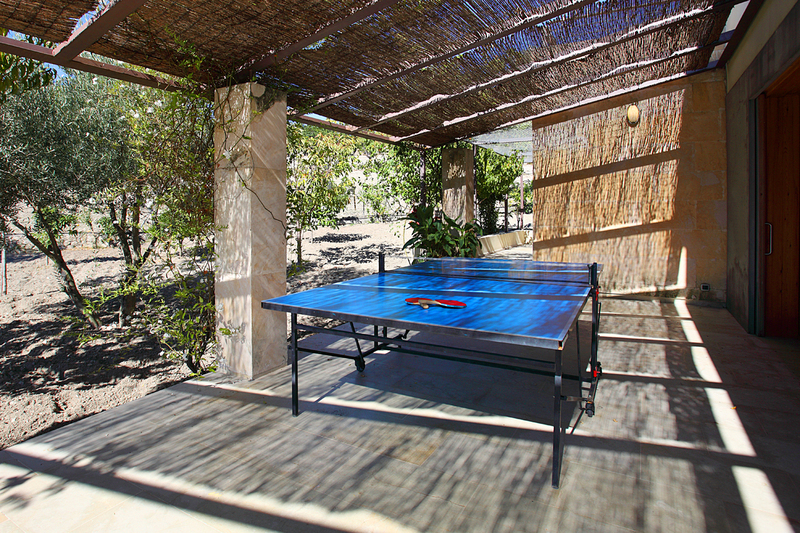 An ideal spot for relaxing or enjoying a siesta away from the midday sun. Just off this seating area we find a second shower room with walk in shower WC and hand basin. 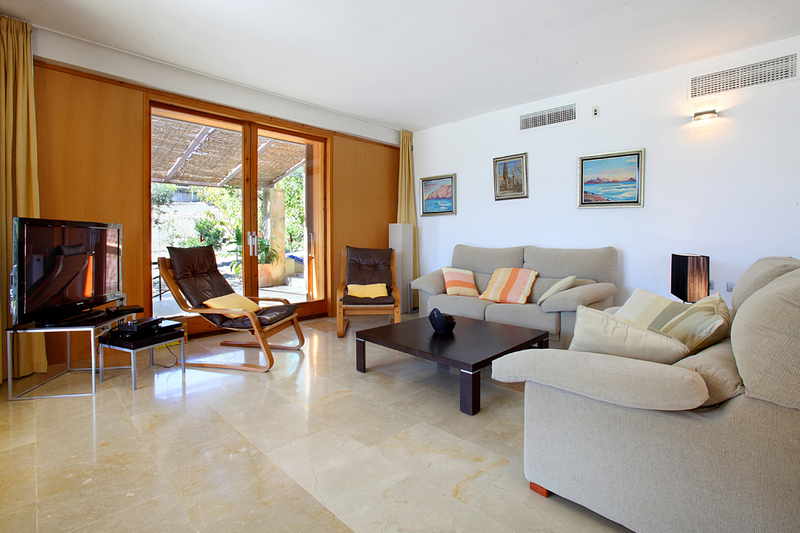 To the left of the stairs there is a double bedroom with en-suite bathroom and boasting access to a shared terrace. 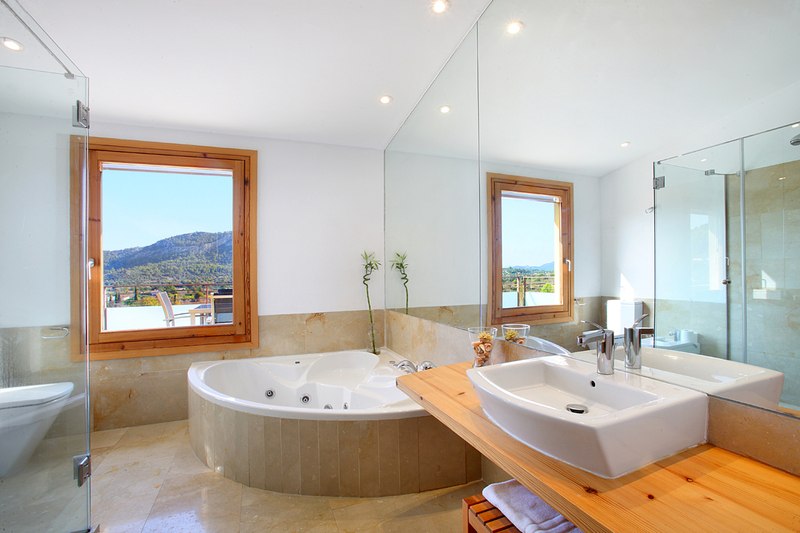 The next bedroom along is the master double with en-suite bathroom with Jacuzzi style corner bath and walk in shower. 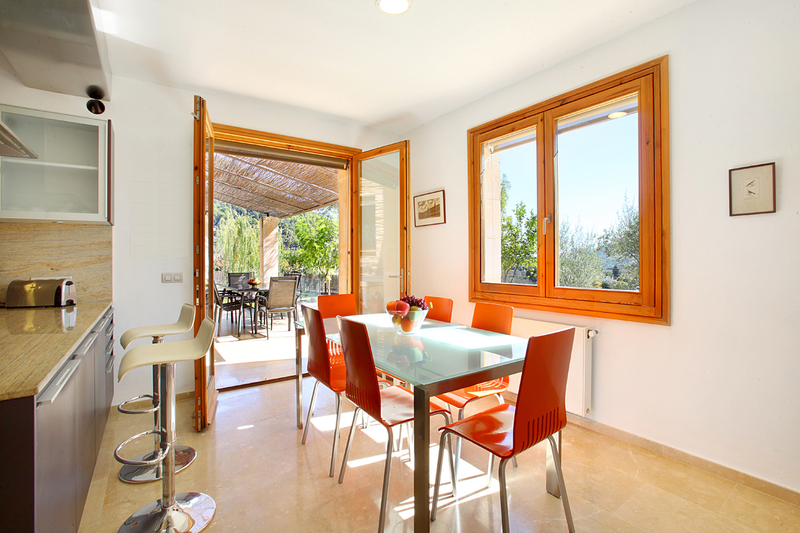 Double doors open out onto a shared terrace. 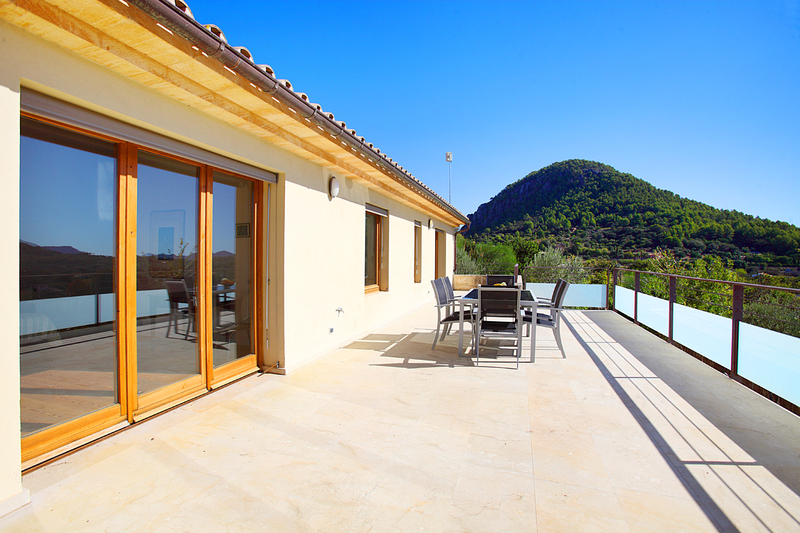 The third bedroom is a twin with en-suite bathroom and side door opening onto a smaller private terrace. 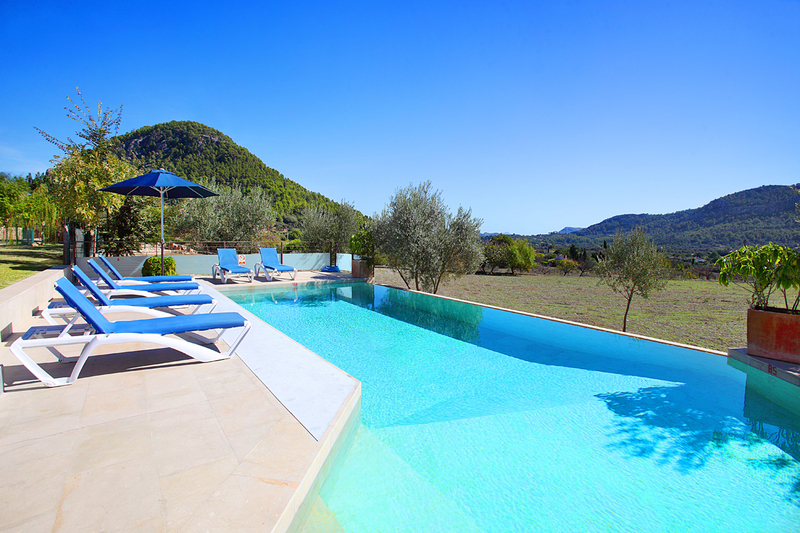 Natural stone coloured tiles cover both the terrace and line the infinity pool which cascades down to one side. 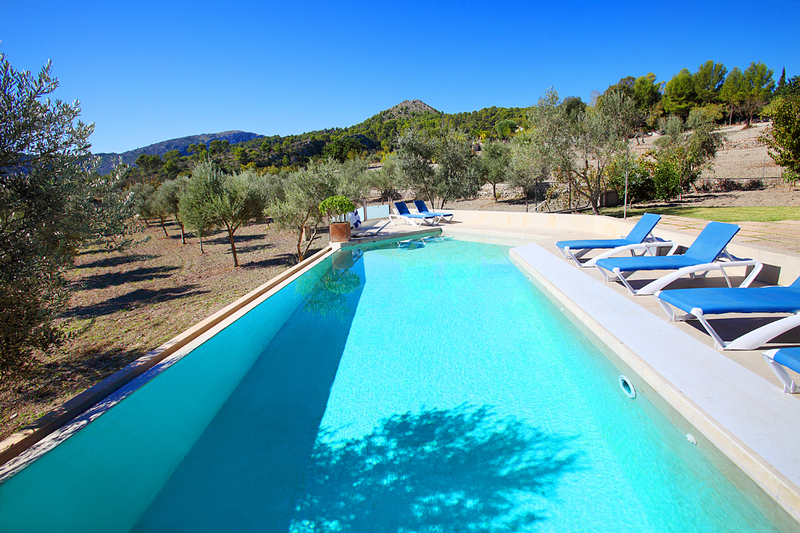 The unique shaped swimming pool has roman steps leading into the crystal clear water. 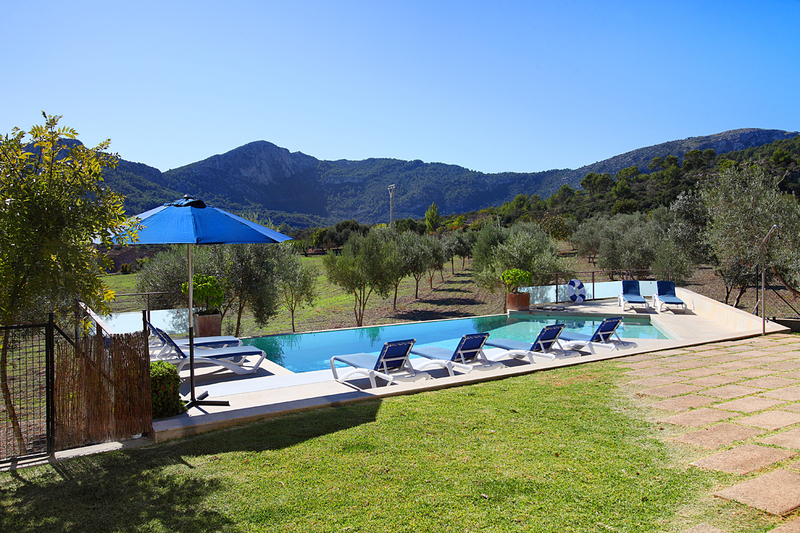 The pool is situated to the rear of the villa and has comfortable sun loungers adorning the surrounding terraces. Within the grounds to the front of the house is a bio-toupe (pond) with circulating water feature and a fenced pond to the side of the house. 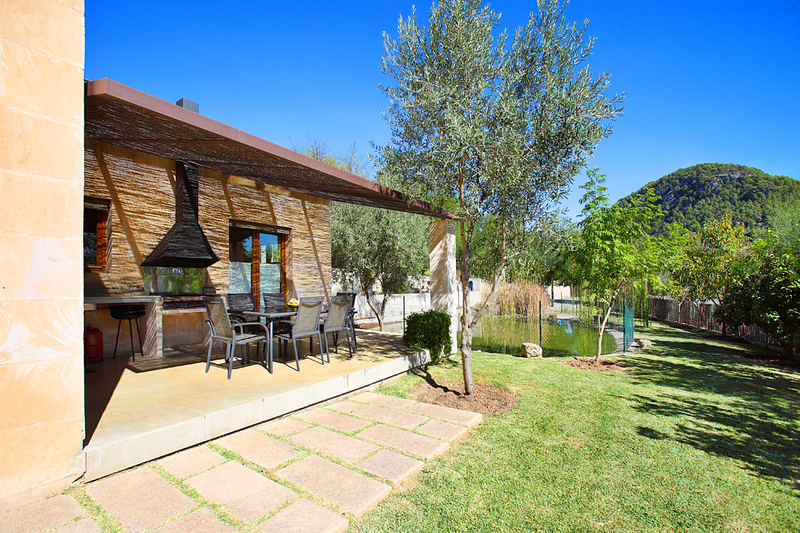 The covered dining terrace adjacent to the pool is an ideal area for total relaxation after dining alfresco from the freshly cooked BBQ or to simply just enjoy the essence of the natural Mediterranean lifestyle.